For the relatively short ride in lower portion of Khargana Gol, start on the two track climb east up the pass from the main paved road (see directions). This is a nice XC workout, and then once you summit the pass, the fun factor escalates as you descend into Khargana Gol valley. The scenic beauty increases too. Khargana Gol is a charming little mountain stream with beautiful forested mountain slopes filling one's line of site in every direction. There is a two track trail that runs up and down the valley (north and south). Also watch for side trails climbing up the slopes on either side. There is over 30 miles of main trail in the valley, and I have no idea how many more miles of side trails. Review: We got another opportunity to ride Khargana Gol this past week. We were able to ride further up the valley. The entire valley is 50 km (30 mi) long. We still have a ways to ride it all, but we are getting closer, and WOW it just gets more beautiful as you go up. Plus the riding is equally good as it is below. The creek gets smaller so all the crossings are rideable as you go up. But you still might want to wear a hiking scandal, so you don't have to think about your feet and you can cool off in the water more easily. The total drop of the valley from top to bottom is 2850 feet, but with the small climbs here and there, the total descending on a ride would likely be over 3500'. 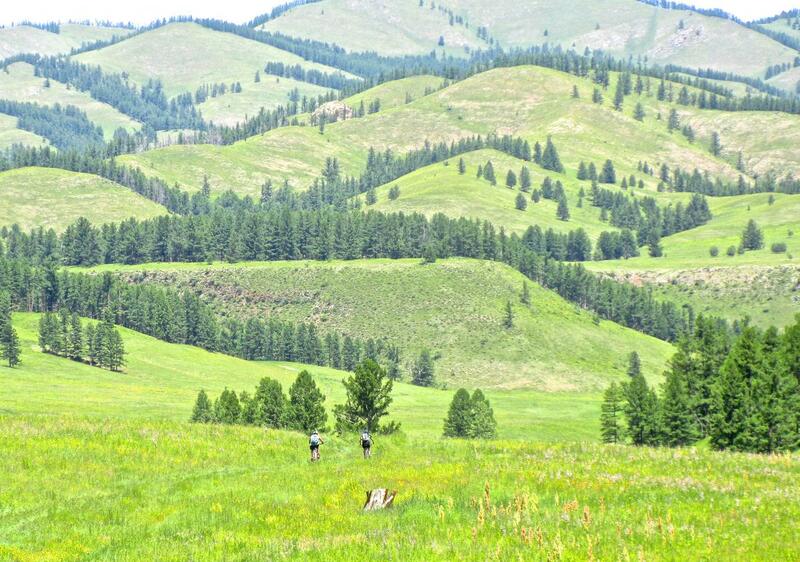 Constant beautiful scenery, awesome high speed riding, nice climbs, golden eagles, true wilderness location, great distance. This really is a nice ride. Review: The ride into the valley from the pass is fast and beautiful. You can do 14 miles if you ride to the Selenge River. You can do 21.5 miles if you continue and follow the Selenge River out to the paved road, but it is quite flat riding along the Selenge. There is some tech on the bottom half of the pass and along the way in the valley itself. There are also wide VERY COLD river crossings. A couple of us took an awesome climb on a nearby peak. From the top, there was a really nice panorama of the Selenge River and the surrounding mountains. All in all, this is just an beautiful place to bike, camp, hike and explore. Even though it may be a beginning or easy intermediate ride in terms of tech, I still have to give it a near 5 star rating for the XC riding and the overall experience. Warning: While biking, watch out for the ground squirrels. They are everywhere. The local population is minus one rodent due to "road kill" by mtb. LOL. That was a "moment" for one of our riders. There are also a few coveys of partridges that will stop your heart cold when they furiously take to flight as you go screaming by them. Review: This is a beautiful mountain valley that is worth riding just for its charming beauty, but the riding is fun too. It's definitely more XC style riding with some thrills thrown in here and there. We've ridden about 25 km of trail in the area and can't wait to go back someday and explore more of the area and the trails. Khargana Gol MTB Trail 4.67 out of 5 based on 3 ratings. 3 user reviews.